Nia Hamm reports from Hennessy's in Boston, where 23-year-old Olivia Ambrose was last seen on Saturday night. Police say they are investigating a report of a missing woman who was last seen on Saturday night at a Boston bar. 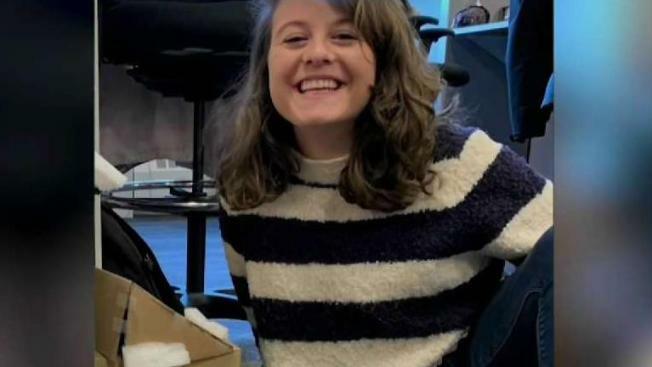 Family members say 23-year-old Olivia Ambrose was last seen outside of Hennessy's, an Irish pub near Faneuil Hall, around 11 p.m. Saturday. She had went to the bar with her twin sister and friends. Olivia's father, Michael Ambrose, is frantically searching for her, handing out missing person posters to do what he can. "It's your worst nightmare," he said. "I'm trying to stay busy, and I'm trying to find her." The Ambrose family has set up a command post inside Hennessy's and have been blanketing Olivia's picture on social media. "It's heartbreaking, it's absolutely heartbreaking," Olivia's mother, Heather Ambrose, said. "There is part of me that feels like it's not real, so it's okay, and there is part of me that just doesn't want to go to any bad place." Olivia is described as 5'2" tall, with blue eyes and curly brown hair. She was last seen wearing a red corduroy dress under a long white and grey coat, and Doc Martens. Olivia's twin sister Francesca says Olivia was last seen at Hennessy's with an unidentified male. Surveillance video shows her leaving the bar with him. The male reportedly purchased drinks with his credit card, and the family said they are working with the bar to see if they can help identify him. "At some point she went to the bathroom, came back and met the guy, and they were talking for a while, and eventually they left together," Francesca Ambrose said. "He was literally like behind us while we were dancing on the dance floor." Olivia Ambrose is a college graduate who just moved to Jamaica Plain a week ago, according to her family. Her family says she always calls and texts, and had an appointment Monday that she missed, so they're extremely worried. "She was supposed to meet with her workmates on Sunday — they had a tentative arrangement — and then she had a doctor's appointment this morning, and she hasn't show up for any of those," said Heather Ambrose. The family says this is totally out of character for Olivia. Boston police confirm that there is an active investigation, but do not have any additional details. Detectives could be seen Monday night canvassing the area. "I don't think anybody can really imagine until they go through it," Heather Ambrose said. "We just want her home, that's all." "It's like your worst nightmare," Francesca Ambrose added.